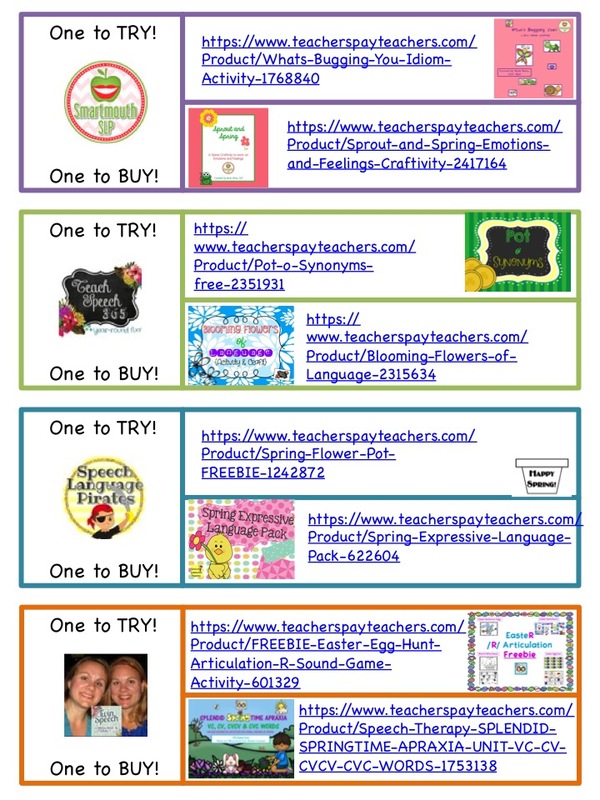 Combining materials and coming up with new ways to meet students’ IEP goals is a great way to make use of the materials you already have. Plus, I find that when my students are having fun in activities that apply the varied goals they have worked on all year, that they really consolidate their growth in a functional way. Don’t you think so, too? So here are some tips for getting your students to use their multiple meaning vocabulary while applying other skills, or just having fun! My students had to use their knowledge of the word meanings to make inferences when they listened to my clues for the words. When they thought they knew the word, they had to catch it and use it in a sentence with the same meaning I was giving clues for. The student with the most cards won. Any drill becomes more fun when there are dice to be rolled. My students particularly love to be able used the colored dice! I took my definition sheets and color coded each with a colored pencil to match the dice I own and added a ‘roll again’ for a different number on each set. Pop the page in a page protector or a reusable pocket and you are ready to go. Students took a die out of a bag (without peeking) and rolled it. They read the matching definition, told the word, used it in a sentence and explained what they meant by the sentence. Then they got to initial that definition. The first student to get initials on all 4 colors was the winner! When I played the colored dice game, I realized that some of students were confused about what I was asking them to do. Have you noticed that happening if you don’t mix the tasks up enough? My students learned to do each task, but when they were combined, they didn’t know which answer to give. So, I made a quick organizer, popped it in a page protector and adapted a set of dollar store dice. After rolling, they had to pick one of their words from their target list and use it in the specified way. If their answer was right, they got to write the word in the box with their color. If not, I modeled the correct response but their turn was over. The student with the most words on the organizer at the end of the session was the winner. 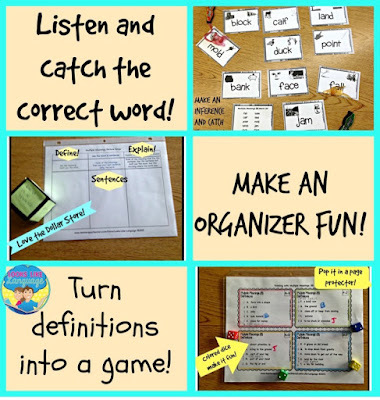 To carry it over, now we can play with the die and the word cards, not using the organizer. These games will be fun with any set of vocabulary words, but using multiple meaning words really makes your students have to think! If you don’t want to make your own word lists, click here to check out mine! 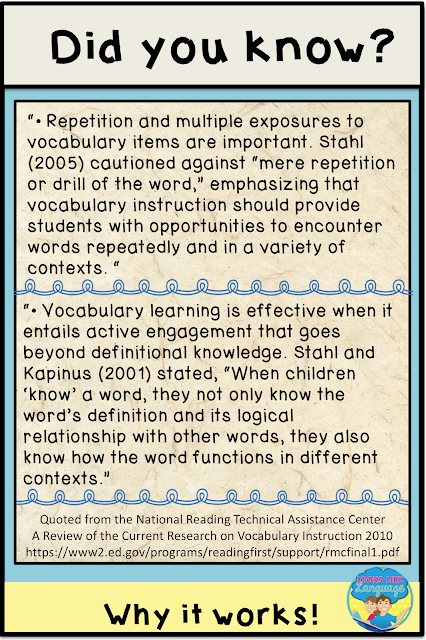 What is your favorite activity for getting students to use vocabulary they have learned? Wow, it is finally spring! I've had some early flowers blooming at my house for a while now, but it is nice to be officially there! Springtime also makes me think of bunnies, eggs and birds building nests. Did you guess? Those are the cute clipart pictures that are in my matching game cards this week! You will have to download it to see just how cute they are! There are some mighty talented clipart artists on TpT! Are your students loving my free games? How about you? Take a second to comment on this blog post and let me know! Happy Spring! No doubt about it, young children who are language impaired need the help of SLPs to expand their vocabulary! Words are the basic building block of sentences and all communication. But what about as students get older? 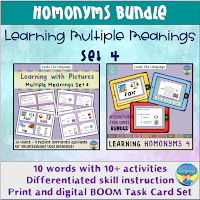 Have you thought about incorporating homonyms, or multiple meaning words? The amount of vocabulary words that upper elementary to high school students are supposed to learn each year is a staggering number that we can’t even begin to remediate in our hour or so weekly. Much of the new vocabulary for older students is gained through reading, curricular teaching and vocabulary building programs used by English teachers to help with college entrance exams. Many special needs students have difficulty reading and aren’t able to really grasp the complete meaning of words taught academically. Some SLPs have success aligning their other goals to the vocabulary being used in the curriculum and are able to support their students’ academic progress this way. My students take so long to accomplish their goals and really understand new vocabulary that this method hasn’t worked well for me. This is why I LOVE multiple meaning words! 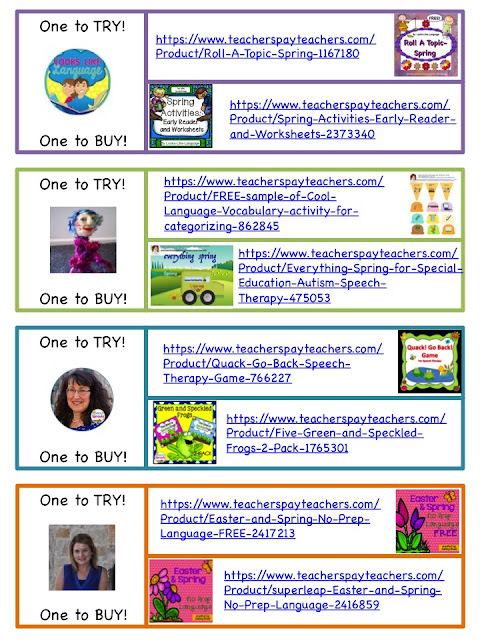 Whether or not my students have specific goals for building vocabulary, I have found that I can increase their language skills in so many ways using this vocabulary. 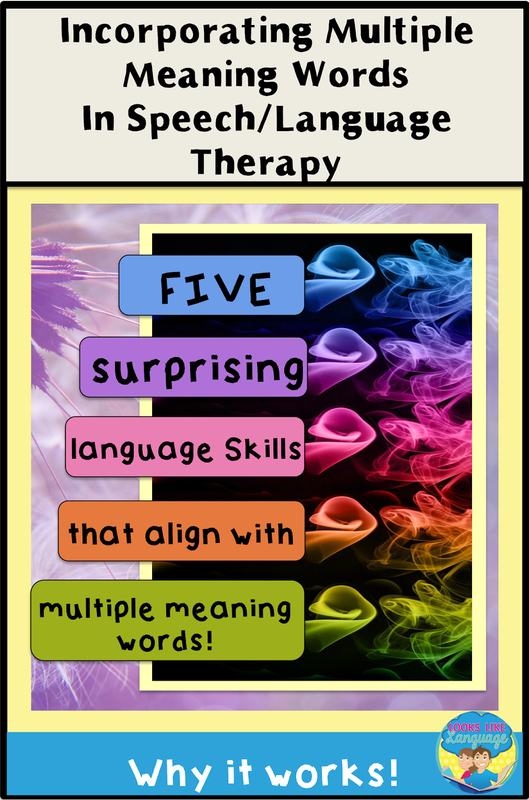 Learning to understand and use multiple meaning vocabulary at a deeper level lets us incorporate many different skills. Want to read more? 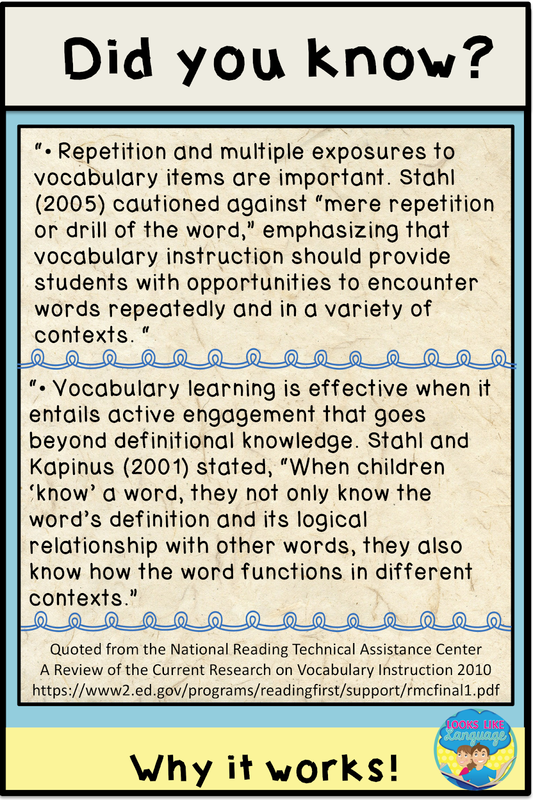 Download the free PDF "A Review f the Current Research on Vocabulary Instruction" from the National Reading Technical Assistance Council in 2010. Many multiple meaning words have a similar theme to their meaning and are just being used as a different part of speech. When students have to fill in the sentence blank with the correct word, they are using sentence structure clues to help them figure out which word and meaning fits that sentence. When students have to figure out which meaning makes sense in a sentence, they are inferring from the context clues to make that decision, by finding a connection between the definition and the other words in the sentence. Multiple meaning words are the first foray into the realm of figurative language. Students hear a word and have a particular meaning (and often picture) in mind. When that meaning doesn’t make sense, they have to draw a new picture in their mind and realize that words aren’t as concrete as they’d like them to be. Flexible thinking! 'I read that word in the sentence and thought it meant this. But that didn’t make sense. It really means something else. The author and I were having different pictures (and thus perspectives) of the same word.' Students who are very literal, like those on the spectrum, can have great difficulty even realizing that there is another way to think about things. When you ask a student to explain which meaning fits in the sentence or story context, they have to figure out the important information and organize it into sentences that will help you understand the point they are making. Do you have students who can parrot a list of meanings but don’t understand vocabulary in context? I did, so I started developing my multiple meaning sets to be able to help my students out. Using the same vocabulary in multiple contexts, with multiple language skills, did the trick for my SPED students who couldn’t retain word meanings or din't understand them correctly in real life situations. Try out the BOOM CardTM free preview in this set! It is a bit surprising how many different language skills can be incorporated into learning multiple meaning words! 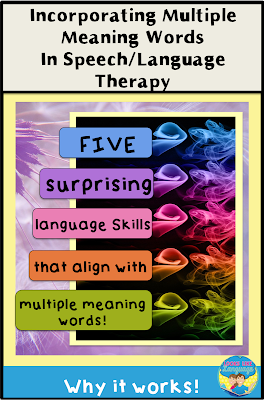 Coming up next week are some therapy tips for making it fun! 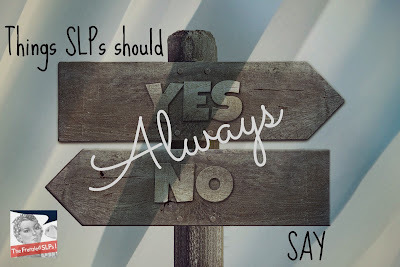 We talk a lot, so there are some things that SLPs should be careful to say! I’m happy to be part of The Frenzied SLPs in this linky to offer some advice! In my ‘SLPs should Never Say’ post, I discussed some phrases that should not be said when addressing anxious parents’ concerns about their newly diagnosed child. Here’s some ideas about what to say instead. When receiving an initial diagnosis on their speech/language delayed child, parents are very naturally concerned and want to have a picture of what is involved. Frequently, they will ask questions to find out what their child is capable of achieving and how long it will take. Tip 1: Tell parents that every child progresses at their own rate, so it is not possible to say when their child will achieve a milestone or catch up to their peers. Commend them for getting the help their child needs, since that is a hard step to take, and assure them that you will work with them to help their child achieve the most that they are capable of learning. Our field is full of professional jargon that we went to school for many years to be able to understand and use. In the school environment, however, most of our communication is with parents and educators who don’t have this background knowledge. Tip 2: Don’t use specialized terms in meetings with educators and parents if they won’t understand them! When you are discussing test results with parents of older students who are severely disordered and have been in therapy for a while, there is no need slam home how disordered their child is. By this point in time, parents have come to realize the size of the problem on their own, to whatever extent they are capable of facing it at the time. If their viewpoint seems somewhat unrealistic to you, remember it is our job to present the student’s current skills as we see it, not to convince parents of their ‘erroneous’ viewpoint. Perhaps this hopeful attitude or the unrealistic expectations are what is enabling the parents to get up every day and keep trying! Tip 3: Provide standard scores or percentile rankings, which show a comparison with their same age peers in a much more realistic manner. Focus your commentary with parents on the functional language skills that are necessary for their child to achieve the highest level of independent functioning they have the capability to achieve. Share specific accomplishments that have moved them closer to that goal and what skills still need to be worked on. Sooner or later, parents with what we consider to have ‘unrealistic’ expectations will be faced with what their child has actually accomplished. As well, sometimes having higher expectations can actually help a student achieve a higher level of skill! It is all too easy to start to compare what a student is like in a structured academic day with professional staff to the stories the parent shares of daily life, to the parents’ detriment. It is not easy to raise any child, with special needs just complicating it more. Also, it isn’t possible to structure home environments like a planned school day. Even if parents had the training, the environment is different, the students are tired at the end of the day and probably not at their best, there usually aren’t enough hands to go around and there is too much to get done at the end of a school day. •Do you think it would be possible to… while you are already…..? Be sure to let the parents know, as well, what you can do with their child in the following days of therapy that could help improve the situation at home! Communication is a two way street! I hope my suggestions help you to keep the lines of communication open when you have discussions with parents. 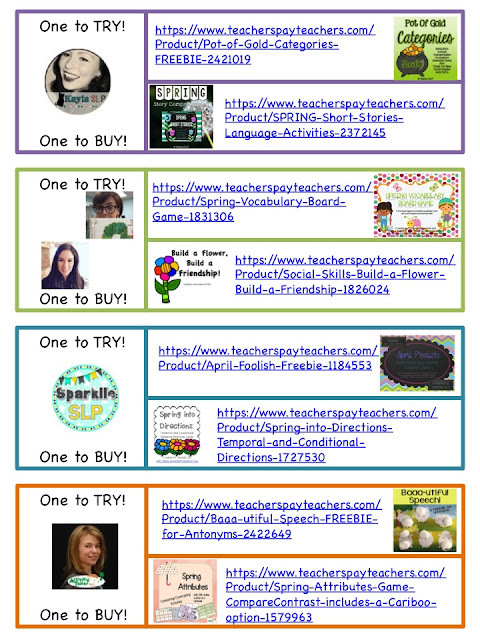 For more super ideas, be sure to check in with the rest of The Frenzied SLPs. Happy St. Patrick's Day! I hope you have had fun today using my St. Patrick's Day Freebie! If you need help getting through the day, there is still time to download my game here. Some days are just like that! While we are busy wearing the green today (and eating Irish soda bread!) there is another holiday right around the corner. Of course, I have you covered! 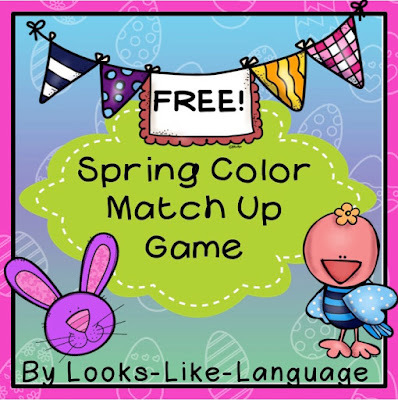 The first part of a cute little open ended freebie game can be downloaded today by clicking here for the updated version. Don't want to wait? Just sign up for my short and sweet newsletter. Besides exclusive freebies and news, you will get a link to my complete freebie set at the beginning- no waiting needed! I hope to see you join me! Thanks for stopping in! Happy Spring! 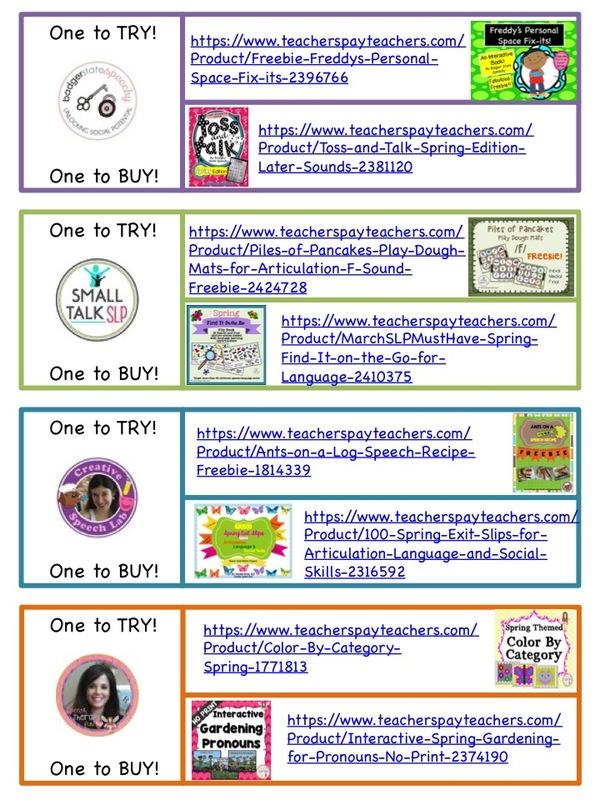 I hope that you are trying out some of these wonderful spring materials (leaving kind feedback, of course!) and that it has made your spring planning easier. Less time planning equals more fun in the nicer weather! Aren't you the lucky one today! 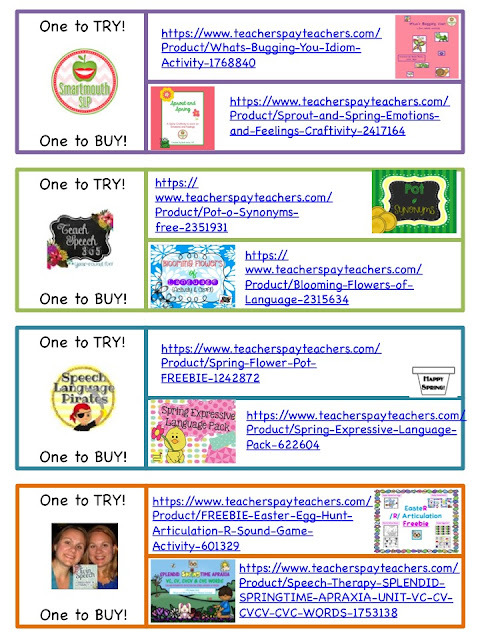 Link up with my most current freebie here! If you appreciate my work, be sure to leave some nice feedback when you download the free game at my store! Crazy for Spring Fun! 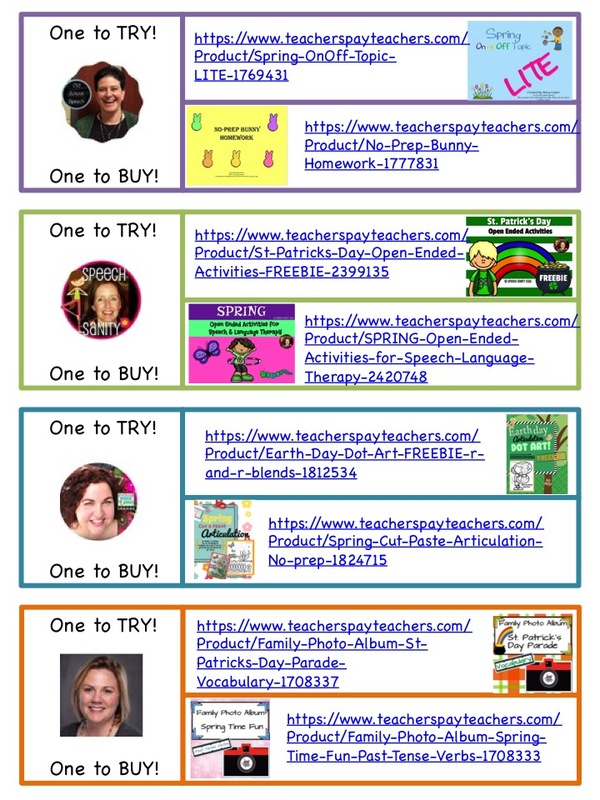 One to Try (FREE!) and One to Buy! Spring is right around the corner, and if you are like me, you are feeling a little crazed for it by this time of year. 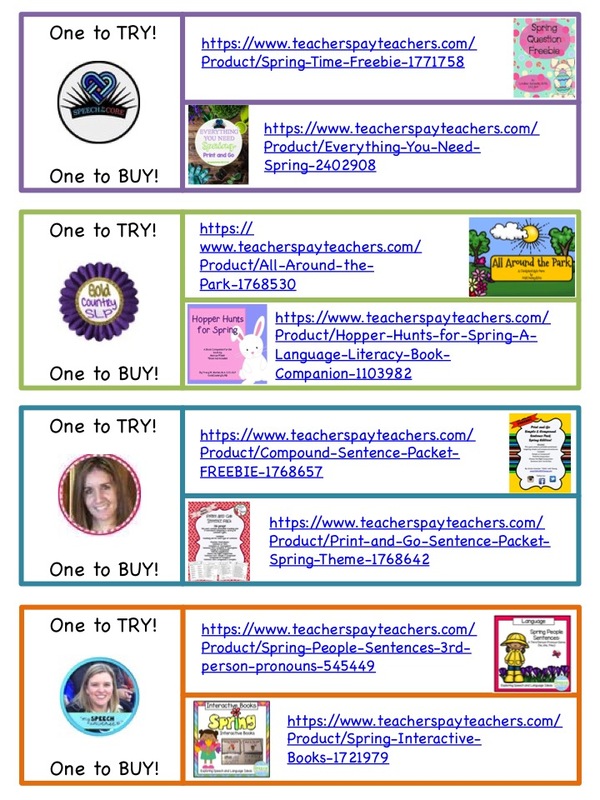 I thought I would give spring a little kick start by showing you some fun products- one to try (FREE!) and one to buy. Please remember, if you download any of the freebies, to give only kind feedback. Each one took hours of work! To get to the products, please use the links below, not those in the pictures. Thanks! This was fun! I started planning for my caseload as I was collecting this list for you! I got so many great ideas, I had to turn it into two lists. The next one will be featured in next week's post. What did you download? Aren't these SLPs amazing? 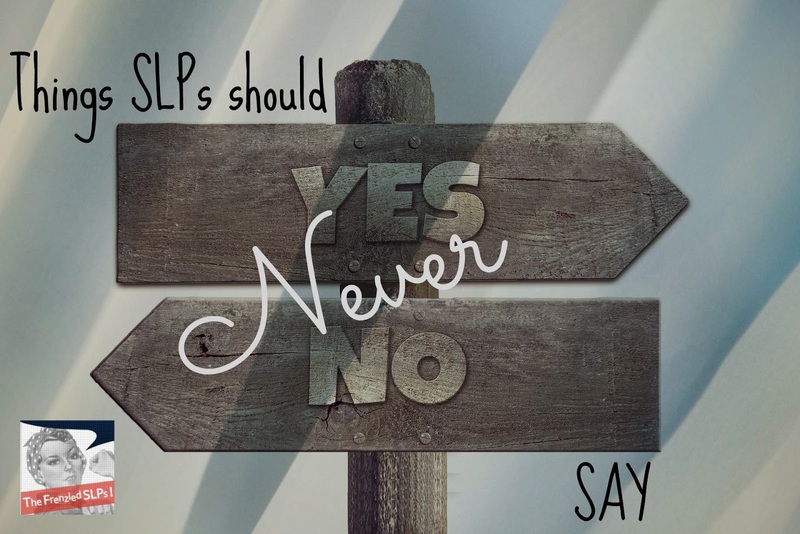 We talk a lot, but there are some things that SLPs should never say! I’m joining The Frenzied SLPs in this linky to offer some advice! Tip 1: When asked to make prognostic predictions, don’t use any definitive statements that include words like never, must, will be able, or won’t be able. Tip 3: Don’t use age level scores when reporting test results for older, severely impaired students. These students are not really functioning just like a child 5-10 years younger, anyway, so the score is meaningless. Tip 4: Don’t use the word ‘should’ when offering suggestions to parents about how to help their child achieve greater skill or carryover in their speech/language goals. This also implies that parents don’t know what they are doing, or that they are doing it incorrectly. Do my ideas have you intrigued? Annoyed? In two weeks, I will be sharing some tips for what to say instead in each of these situations. For more ideas, be sure to link back to The Frenzied SLPs! Thanks to Doyle Speech Works, Sparklle SLP, and All Y'all Need for hosting this month! What do you think that SLPs should never say?